A Jermaine McSporran goal four minutes into stoppage time saw Wanderers register their second successive away victory and keep the play-off hopes burning. On a bright and sunny afternoon at Bournemouth's revamped stadium, Wanderers had taken a 68th minute lead when Sean Devine bagged his third goal in as many games, converting from close range after Danny Senda's shot from the right had been parried by The Cherries 'keeper. Eddie Howe pegged the scores back level when he headed back across Taylor at the far post from a Danny Thomas corner. However, Wycombe pressed on in the five minutes of stoppage time and got their reward when McSporran rose to head home from Michael Simpson's right wing cross and delight the sizeable and noisey support from Wycombe. Lawrie Sanchez made one change from the side that had won at Chesterfield in the week, Martyn Lee getting his first start of the season with Steve Brown relegated to the bench. However, it was a game that didn't really suit Lee's style and it was the introduction of Brown during the second-half that eventually tipped the game in Wycombe's favour. Neither 'keeper were overworked in a quiet first half, although it was the home side that looked more likely to break the deadlock. As early as the third minute Carl Fletcher fired an effort wide of Martin Taylor's left hand post, while on 9 minutes Jason Tindall got free from Lee down the right and Tresor Kandol was only inches away from converting the cross at the far post. The Cherries continued to threaten when Stephen Purches sent in a low cross from the left on 12 minutes and Roger Johnson was grateful to see his sliced clearance go wide of the far post. It was a rare slip by the youngster who had another impressive game in a Wycombe shirt. Wanderers responded with a spell of possession of their own and created a number of half chances. On 18 minutes Stuart Roberts' controlled cross from the left was flicked just wide of the far post by the head of Devine, while four minutes later Devine himself tried to work the ball home after Chris Vinnicombe had fed the ball in from the left flank. Dannie Bulman provided Wycombe's first effort on target six minutes into the second-half when he ran through from midfield but could only shoot straight at Gareth Stewart in the Cherries goal. Richard Hughes saw a half-volley picked out by Taylor on 53 minutes before Steve Brown was introduced for Wycombe. 'Brownie' gave Wanderers far more bite in midfield but it was the loss of Johnson on 64 minutes that provided concern for Wycombe. Johnson limped off with a knee injury and was replaced by the 'play anywhere man' Keith Ryan. Michael Simpson was booked shortly afterwards for kicking the ball away and for a while it looked if the day might turn sour for Wycombe. However, if anything, the events fired up Wycombe to another level with Simpson influential in both of Wanderers' goals. 'Simo' mananged to get the ball through to Danny Senda on 68 minutes and when Senda's shot was parried by Stewart, a certain Mr Devine was on hand to steer the ball home from close range. Sanchez brought on McSporran for Roberts immediately after Devine's goal and 'Jocky' had a great chance to make the score 2-0 on 74 minutes but he could only blaze the ball over when Simpson's cross from the right eventually broke loose at the near post. Thoughts were just turning to three points in the bag when on 77 minutes the home side levelled. It was Howe who exposed Wycombe's defence and it was a disappointing goal to concede. To Wycombe's credit they could settled for a point but instead they made the most of the five minutes of stoppage time. Brown made a fantastic tackle to win the ball inside the Wycombe half before pushing the ball forward. Simpson's ball to the edge of the penalty area saw Stewart come forward and head the ball clear but in one final effort Simpson slung in the ball again from the right and it found an unmarked McSporran who directed his header past Stewart and into the corner of the net for the winner. 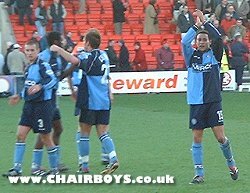 A fortunate win perhaps but after some many negative results at Bournemouth over the years there were few complaints at the end and Wycombe celebrated like they had won a cup.